commented on "SkinDNA™ is a revolutionary DNA laboratory test that examines 16 genetic markers (SNPs) in 5 categories associated with skin aging. ..."
SkinDNA™ is a revolutionary DNA laboratory test that examines 16 genetic markers (SNPs) in 5 categories associated with skin aging. Your DNA results are used to scientifically create a personalised guide providing you with a unique regime tailored specifically to you. This allows you to advance beyond the 'one-size-fits-all' suggestions using the right skincare ingredients targeted to your own genetic blueprint. SkinDNA™ allows professionals to advance beyond the confusion of thousands of skincare options and ensures customers never waste a single cent on products or treatments that don't work for them again. Let SkinDNA™ take the guesswork out of skin care, instead using science to identify the most suitable skincare ingredients, oral supplements and treatment modalities based on your DNA. 1: The SkinDNA™ Genetic test can help identify if you are a carrier of key genetic variations associated with accelerated collagen loss even before the signs have become visible. Keeping the skin firm, plump and wrinkle-free, Collagen is the principle structural protein of the skin. Like many components of the body, collagen undergoes continuous turnover, being produced and recycled on an ongoing basis throughout your life. When you are younger, your body makes more collagen than it loses, but after about the age of 40, collagen loss can accelerate, leading to a decline in the health and appearance of your skin. 2: If you're like most people, then no one has ever told you about glycation. Affecting the ability of collagen and elastin fibers to function normally, glycation is now well recognised to be a leading cause of accelerated skin aging. Our genetic predispositions play a big role in determining serum glucose levels. Key variations in this genetic category play a key role in preventing glycation of your skin. It is responsible for controlling serum glucose levels, energy intake, and energy release. Having variations in this gene can alter your body's ability to maintain normal glucose levels and interfere with energy metabolism, both of which lead to glycation. Glucose is the sugar your body uses as its main source of fuel. If not metabolized properly, glucose can bind to your skin's collagen and elastin fibers, forming abnormal chemical bridges that cause tissue damage. This process, called glycation, causes your skin to become rigid and lose elasticity. Glycation also impairs your skin's ability to regenerate, which leads to skin laxity, cracking, thinning, redness and inability to self-repair. 3: The sun's UV rays are one of the most significant causes of premature skin aging. Your genes play an important role in determining how well your skin can naturally cope under the strains of the sun. Exposure to ultraviolet (UV) light from the sun accounts for 90% of the symptoms of early skin aging, skin damage and skin cancer. Every time your skin is exposed to UV light, skin damage occurs. The cumulative effect of repeated sun damage causes epidermal DNA damage, persistent inflammation, and oxidative stress negatively affecting the health and appearance of your skin. Our genetic predispositions play an important role in determining how your skin can naturally cope under the strains of the sun. 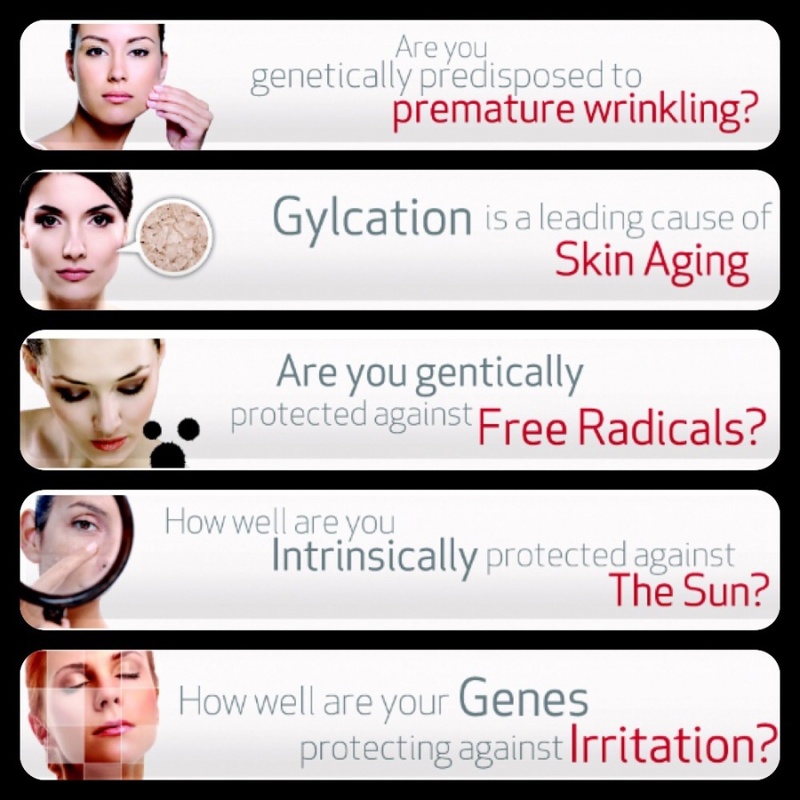 The SkinDNA™ Test can reveal if your skin has a greater or lesser natural genetic solar protection factor (gSPF™), and based on your results can provide you with a unique, enhanced skin care protection strategy that is specially designed to provide the utmost protection for your skin based on your genes . 4: Scientists now believe that free radicals are causal factors in nearly every known disease, from heart disease to arthritis, cancer to cataracts. In fact, free radicals are a major culprit in the aging process of the skin itself. Research at SkinDNA™ has shown that the amount of antioxidants in your body is directly proportional to the healthy long-term appearance of your skin! Free radicals are highly reactive short-lived molecules that can damage virtually any molecule in our body including the important cellular structures found in the body's largest organ, the skin. Not all people have the same amount of these powerful free radical scavengers. A number of skin related genetic variations have been found to alter the production of antioxidant protecting molecules and your SkinDNA™ score is the single most powerful indication of your body's genetic antioxidant abilities. 5: Genetic variations found in vital genes can lead to excessive inflammation, one of the most common themes in early onset aging. Ever wondered why your skin becomes sensitive in the winter or why your skin breaks out in the heat? How about developing skin rash or rosacea after applying perfumes or skincare? Many of these redness and sensitivity issues are instigated by your bodies first primal defence, inflammation. Your genetic predispositions play a big role in determining the supply or the over-supply of inflammation production. Key variations tested in this category can identify numerous over-reactive inflammatory mechanisms that cause skin irritations.